Catholic leaders in Hong Kong have spoken out as the student-led occupation that has paralysed the city spread on China’s National Day on Wednesday. 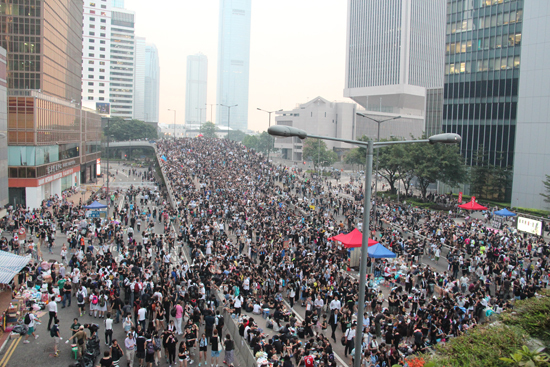 Tens of thousands of people, including students and members of a movement called Occupy Central with Love and Peace, have taken to the streets of Hong Kong’s business district. They are protesting against the Chinese Government’s attempts to control the 2017 election for Hong Kong’s mayor. Schools and banks were forced to close on Monday because of the protests, some of the biggest demonstrations in the city’s history. Cardinal Joseph Zen Ze-kiun, 82, the emeritus bishop of Hong Kong, who is well known for his outspokenness on political and religious liberty, addressed protesters in the city’s central financial district and led a prayer service. “Beijing does not allow civil nomination because they fear us,” he said; “they do not trust in us, thinking that we will intentionally choose a leader who will confront them”. 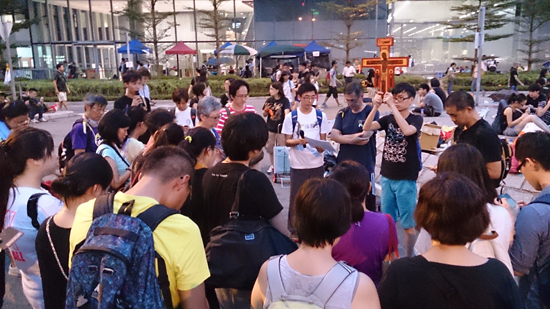 Protestants and Catholics are among the key players in the Occupy Central movement. Along with Cardinal Zen, they have regularly been branded the “troublesome gangsters of Hong Kong” in pro-Beijing newspapers in the territory. Although Protestants and Catholics make up just 7 per cent and 5 per cent respectively of the population, Christians in particular fear the influence of Beijing on religious freedom. Cardinal John Tong Hon, Bishop of Hong Kong, urged calm, but discreetly urged politicians “to listen to the younger generation and to citizens from all walks of life” and “exercise restraint in the deployment of force”. In July 2013 the diocese of Hong Kong issued a statement urging that “the Chief Executive shall be directly elected by universal suffrage in 2017 – on a one person, one vote basis”. Earlier this week the Hong Kong Federation of Catholic Students criticised the police’s excessive use of violence when dispersing “unarmed students”.